The expert of French music as well as the pianist of excellent virtuosity and musicality, Abdel Rahman El Bacha, the winner of the Queen Elisabeth of Belgium Piano Competition by unanimous judgment in 1978, has lead the music world, especially in Europe. 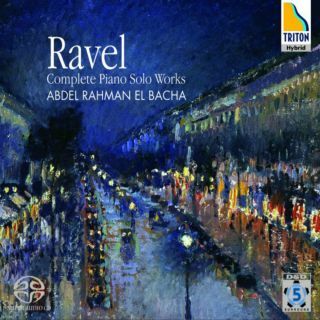 This is the latest, complete album of Ravel’s piano solo works by Maestro of high maturity. Born in Beyrouth in 1958 in a family of musicians and nephew of a famous painter, he started his piano schooling in 1967 with Zvart Sarkissian, a pupil of Marguerite Long and Jacques Février. At the age of 10 he gave his first concert with an orchestra. In 1973 Claudio Arrau predicted a great career for him and in 1974 he was offered a scholarship by France, the former USSR and Great Britain. He took up the French offer out of cultural affinity and entered the Paris Conservatoire in the class of Pierre Sancan. He graduated with 4 first prizes (piano, chamber music, harmony and counterpoint). After the Concours Reine Elisabeth which launched him on the international scene, he chose to bide his time in order to enlarge and further study his repertory. From that moment on, the musical press started comparing him to the greatest pianists, stressing the exceptional qualities of his playing and his emotional power. From the Salzburg Mozarteum to the Paris Théâtre des Champs Elysées, from the Berlin Philharmony to the Amsterdam Concertgebouw, he performs today all over Europe, in Russia, Japan, the Midlle East, the U.S.A, Central and South America. In June 1978, Abdel Rahman El Bacha won the Concours Reine Elisabeth de Belgique by a unanimous judgment. He was also awarded the Audience Prize. He was only 19. His vast repertory, including almost 60 concertos, is based mainly on the works of Bach, Mozart, Beethoven, Schubert, Chopin, Schumann, Rachmaninov, Ravel and Prokofief. He has performed under eminent conductors with prestigious orchestras such as the Berlin Philharmonic, the Royal Philharmonic, The Orchestre de Paris, the NHK Tokyo, the Orchestre de la Suisse Romande... In 1983, his first recording for the label Forlane, Early Works by Prokofiev, was awarded the "Grand Prix de l'Académie Charles Cros". He received it from the hands of Mrs Prokofief herself. For the same label he has recorded 3 Concertos by Bach, Ravel's 2 Concertos and works by Schumann, Ravel and Schubert. His recording of Beethoven's complete Piano Sonatas, just as his concert performances of these works, were heralded by the press as a "major event". The second CD of these Beethoven recordings, as well as his Ravel recital, were awarded the "Grand Prix de la Nouvelle Académie du Disque Français." For Chopin's Melodies with Ewa Podlès, he also received the "Gerarld Moore Prize" - best accompanist - from the Académie du Disque Lyrique. He has also recorded Chopin's complete solo piano works (12 CD) in chronological order. In March 2002, he obtained a triumph in Nantes, with the complete piano solo works of Chopin given (by heart) in 16 recitals over a period of six days in a row. He renewed this experience at La Roque d'Anthéron Festival in 15 recitals given in July 2003 and this year at the Sintra Festival (Portugal) and in Avignon. The 2 CD of Chopin's complete works for piano and orchestra, recorded with the Orchestre de Bretagne conducted by Stefan Sanderling are also available. In September 2004, A.R El Bacha recorded "live" for Fuga Libera Sergei Prokofief's 5 Concertos with the Monnaie Symphony Orchestra in Brussels,conducted by Kazushi Ono. Abdel Rahman El Bacha was granted the double French-Lebanese citizenship in 1981. He is also a composer. On March 22.2022, the Orchestre Régional de Cannes-Provence-Côte d'Azur created 2 Préludes mystiques he has written. He was made "Chevalier des Arts et des Lettres" by the French Minister of Culture in 1998 and he has been awarded the "Médaille de l'Ordre du Mérite "1"" by the President of the Republic of Lebanon, the highest distinction of his native country. Abdel Rahman El Bacha lives near Paris.